In order to rule out plasma cell myeloma a skeletal survey was performed which showed no lytic lesions. A bone marrow aspirate and trephine biopsy showed 6% plasma cells confirming a plasma cell neoplasm but not fulfilling the criteria for myeloma. In the absence of any lymphadenopathy or B symptoms lymphoma is unlikely. 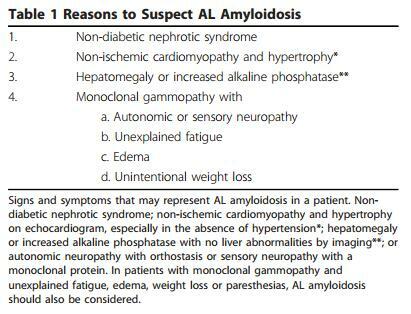 This would usually be classified as MGUS but as the patient has symptoms of amyloid it is important to rule this out. What testing can be done to look for presence of amyloid? How would you investigate for end organ damage? This entry was posted in Myeloma/paraproteins and tagged amyloid, myeloma, plasmacytoma. Bookmark the permalink.